Emerging zoonotic viruses cross the species barrier from animals to humans or vice-versa. Their ability to propagate in human cells is dependent on a variety of factors, most importantly, the ability to target particular cell types by binding to receptor molecules displayed on the surface of the host cell. Our group is interested in applying techniques in structural biology, immunology, and cell biology, to delineate the role of viral glycoproteins during infection and antibody-mediated neutralization. We are particularly interested in studying tropical and exotic RNA viruses for which there are limited vaccines or treatments and which are often underrepresented in terms of academic and pharmaceutical interest. Our biophysical studies have revealed common strategies by which viruses have evolved to interact with natural hosts and also support molecular-level rationales for how viruses can be transmitted to unrelated organisms and thus pose severe health risks. Ultimately, the structural information revealed from this work is being aimed towards the development of therapeutic antibodies and antiviral reagents which can inhibit viral entry processes. Ebolavirus is a pathogen capable of causing highly lethal haemorrhagic fever in humans. The envelope-displayed viral glycoprotein is the primary target of humoral immunity induced by both natural exposure and vaccination. The epitopes targeted by B cells have been thoroughly characterised by functional and structural analyses of the glycoprotein, GP, yet there is a paucity of information regarding the cellular immune response to Ebolavirus. To date, no T cell epitopes in the glycoprotein have been characterised in detail in humans. A recent Phase I clinical trial of a heterologous prime-boost vaccination regime with viral vectors encoding filovirus antigens elicited strong humoral and T cell responses in vaccinees. Using samples from this trial, the most frequently recognised peptide pools were studied in more detail to identify the minimal epitopes recognised by antigen-specific T cells and associated HLA-restrictions. Using IFNγ ELISPOT and flow cytometry, we characterised nine highly immunogenic T cell epitopes located on both the GP1 and GP2 subunits of the Ebolavirus GP. Epitope mapping revealed the location of these epitopes as presented on the mature virion. HLA-typing on all participants, combined with in silico epitope analysis, determined the likely MHC class I restriction elements. Thirteen HLA-A and -B alleles were predicted to present the identified epitopes, suggesting promiscuous recognition and induction of a broad immune response. The glycoprotein of Ebolavirus is highly immunogenic, inducing both CD4+ and CD8+ T cell responses and we have shown here for the first time that these responses are associated with multiple HLA types. Delivery of this antigen using a heterologous prime-boost approach with ChAd3 and MVA is likely to be highly immunogenic in genetically diverse human populations, due to the induction of responses against multiple immunodominant epitopes. The emergence of Old and New World arenaviruses from rodent reservoirs persistently threatens human health. The GP1 subunit of the envelope-displayed arenaviral glycoprotein spike complex (GPC) mediates host cell recognition and is an important determinant of cross-species transmission. Previous structural analyses of Old World arenaviral GP1 glycoproteins, alone and in complex with a cognate GP2 subunit, have revealed that GP1 adopts two distinct conformational states distinguished by differences in the orientations of helical regions of the molecule. Here, through comparative study of the GP1 glycoprotein architectures of Old World Loei River virus and New World Whitewater Arroyo virus, we show that these rearrangements are restricted to Old World arenaviruses and are not induced solely by the pH change that is associated with virus endosomal trafficking. Our structure-based phylogenetic analysis of arenaviral GP1s provides a blueprint for understanding the discrete structural classes adopted by these therapeutically important targets.IMPORTANCE The genetically and geographically diverse group of viruses within the family Arenaviridae includes a number of zoonotic pathogens capable of causing fatal hemorrhagic fever. The multisubunit GPC glycoprotein spike complex displayed on the arenavirus envelope is a key determinant of species tropism and a primary target of the host humoral immune response. Here, we show that the receptor-binding GP1 subcomponent of the GPC spike from Old World but not New World arenaviruses adopts a distinct, pH-independent conformation in the absence of the cognate GP2. Our analysis provides a structure-based approach to understanding the discrete conformational classes sampled by these therapeutically important targets, informing strategies to develop arenaviral glycoprotein immunogens that resemble GPC as presented on the mature virion surface. The substantial increase in prevalence and emergence of antigenically divergent or highly pathogenic influenza A(H7N9) viruses during 2016-17 raises concerns about the epizootic potential of these viruses. We investigated the evolution and adaptation of H7N9 viruses by analyzing available data and newly generated virus sequences isolated in Guangdong Province, China, during 2015-2017. Phylogenetic analyses showed that circulating H7N9 viruses belong to distinct lineages with differing spatial distributions. Hemagglutination inhibition assays performed on serum samples from patients infected with these viruses identified 3 antigenic clusters for 16 strains of different virus lineages. We used ancestral sequence reconstruction to identify parallel amino acid changes on multiple separate lineages. We inferred that mutations in hemagglutinin occur primarily at sites involved in receptor recognition or antigenicity. Our results indicate that highly pathogenic strains likely emerged from viruses circulating in eastern Guangdong Province during March 2016 and are associated with a high rate of adaptive molecular evolution. Current antigenic targets for influenza vaccine development are either highly immunogenic epitopes of high variability or conserved epitopes of low immunogenicity. This requires continuous update of the variable epitopes in the vaccine formulation or boosting of immunity to invariant epitopes of low natural efficacy. Here we identify a highly immunogenic epitope of limited variability in the head domain of the H1 haemagglutinin protein. We show that a cohort of young children exhibit natural immunity to a set of historical influenza strains which they could not have previously encountered and that this is partially mediated through the epitope. Furthermore, vaccinating mice with these epitope conformations can induce immunity to human H1N1 influenza strains that have circulated since 1918. The identification of epitopes of limited variability offers a mechanism by which a universal influenza vaccine can be created; these vaccines would also have the potential to protect against newly emerging influenza strains. Little is known about the intermolecular dynamics and stoichiometry of the interactions of the human immunodeficiency virus type 1 (HIV-1) envelope (Env) protein with its receptors and co-receptors on the host cell surface. Here we analyze time-resolved HIV-1 Env interactions with T-cell surface glycoprotein CD4 (CD4) and C-C chemokine receptor type 5 (CCR5) or C-X-C chemokine receptor type 4 (CXCR4) on the surface of cells, by combining multicolor super-resolution localization microscopy (direct stochastic optical reconstruction microscopy) with fluorescence fluctuation spectroscopy imaging. Utilizing the primary isolate JR-FL and laboratory HXB2 strains, we reveal the time-resolved stoichiometry of CD4 and CCR5 or CXCR4 in the pre-fusion complex with HIV-1 Env. The HIV-1 Env pre-fusion dynamics for both R5- and X4-tropic strains consists of a three-step mechanism, which seems to differ in stoichiometry. Analyses with the monoclonal HIV-1-neutralizing antibody b12 indicate that the mechanism of inhibition differs between JR-FL and HXB2 Env. The molecular insights obtained here identify assemblies of HIV-1 Env with receptors and co-receptors as potential novel targets for inhibitor design. Surveillance of avian influenza viruses is crucial for the characterization of viral diversity in bird populations. Although virulent phenotypes are complex traits, several molecular determinants of pathogenicity in avian influenza viruses have been well characterised, particularly the polybasic proteolytic cleavage site within the Hemagglutinin protein, which allows a systemic spread of the infection in avian hosts. We hypothesise that the parallel evolution of highly pathogenic lineages, from low-pathogenic ancestors, may have been facilitated by permissive or compensatory secondary mutations occurring anywhere in the viral genome. We used a comparative phylogenetic and structural approach to detect mutations across the whole genome of avian influenza viruses of the H7NX subtype, that are shared by multiple, independent highly pathogenic lineages. Parallel mutations occur frequently among highly pathogenic outbreaks. Mutations strongly associated with the HP phenotype may function as an early detection system for transitional virulence stages. Lassa virus is an Old World arenavirus endemic to West Africa that causes severe hemorrhagic fever. Vaccine development has focused on the envelope glycoprotein complex (GPC) that extends from the virion envelope. The often inadequate antibody immune response elicited by both vaccine and natural infection has been, in part, attributed to the abundance of N-linked glycosylation on the GPC. Here, using a virus-like-particle system that presents Lassa virus GPC in a native-like context, we determine the composite population of each of the N-linked glycosylation sites presented on the trimeric GPC spike. Our analysis reveals the presence of underprocessed oligomannose-type glycans, which form punctuated clusters that obscure the proteinous surface of both the GP1 attachment and GP2 fusion glycoprotein subunits of the Lassa virus GPC. These oligomannose clusters are seemingly derived as a result of sterically reduced accessibility to glycan processing enzymes, and limited amino acid diversification around these sites supports their role protecting against the humoral immune response. Combined, our data provide a structure-based blueprint for understanding how glycans render the glycoprotein spikes of Lassa virus and other Old World arenaviruses immunologically resistant targets. Entry of enveloped viruses relies on insertion of hydrophobic residues of the viral fusion protein into the host cell membrane. However, the intermediate conformations during fusion remain unknown. Here, we address the fusion mechanism of Rift Valley fever virus. We determine the crystal structure of the Gn glycoprotein and fit it with the Gc fusion protein into cryo-electron microscopy reconstructions of the virion. Our analysis reveals how the Gn shields the hydrophobic fusion loops of the Gc, preventing premature fusion. Electron cryotomography of virions interacting with membranes under acidic conditions reveals how the fusogenic Gc is activated upon removal of the Gn shield. Repositioning of the Gn allows extension of Gc and insertion of fusion loops in the outer leaflet of the target membrane. These data show early structural transitions that enveloped viruses undergo during host cell entry and indicate that analogous shielding mechanisms are utilized across diverse virus families. Antigenic targets of influenza vaccination are currently seen to be polarised between (i) highly immunogenic (and protective) epitopes of high variability, and (ii) conserved epitopes of low immunogenicity. This requires vaccines directed against the variable sites to be continuously updated, with the only other alternative being seen as the artificial boosting of immunity to invariant epitopes of low natural efficacy. However, theoretical models suggest that the antigenic evolution of influenza is best explained by postulating the existence of highly immunogenic epitopes of limited variability. Here we report the identification of such an epitope of limited variability in the head domain of the H1 haemagglutinin protein. We show that the epitope mediates immunity to historical influenza strains not previously seen by a cohort of young children. Furthermore, vaccinating mice with these epitope conformations can induce immunity to all the human H1N1 influenza strains that have circulated since 1918. The identification of epitopes of limited variability offers a mechanism by which a universal influenza vaccine can be created; these vaccines would also have the potential to protect against newly emerging influenza strains. Transmission of hemorrhagic fever New World arenaviruses from their rodent reservoirs to human populations poses substantial public health and economic dangers. These zoonotic events are enabled by the specific interaction between the New World arenaviral attachment glycoprotein, GP1, and cell surface human transferrin receptor (hTfR1). Here, we present the structural basis for how a mouse-derived neutralizing antibody (nAb), OD01, disrupts this interaction by targeting the receptor-binding surface of the GP1 glycoprotein from Junín virus (JUNV), a hemorrhagic fever arenavirus endemic in central Argentina. Comparison of our structure with that of a previously reported nAb complex (JUNV GP1-GD01) reveals largely overlapping epitopes but highly distinct antibody-binding modes. Despite differences in GP1 recognition, we find that both antibodies present a key tyrosine residue, albeit on different chains, that inserts into a central pocket on JUNV GP1 and effectively mimics the contacts made by the host TfR1. These data provide a molecular-level description of how antibodies derived from different germline origins arrive at equivalent immunological solutions to virus neutralization. A novel H7N9 avian influenza virus has caused five human epidemics in China since 2013. The substantial increase in prevalence and the emergence of antigenically divergent or highly pathogenic (HP) H7N9 strains during the current outbreak raises concerns about the epizootic-potential of these viruses. Here, we investigate the evolution and adaptation of H7N9 by combining publicly available data with newly generated virus sequences isolated in Guangdong between 2015-2017. Phylogenetic analyses show that currently-circulating H7N9 viruses belong to distinct lineages with differing spatial distributions. Using ancestral sequence reconstruction and structural modelling we have identified parallel amino-acid changes on multiple separate lineages. Furthermore, we infer mutations in HA primarily occur at sites involved in receptor-recognition and/or antigenicity. We also identify seven new HP strains, which likely emerged from viruses circulating in eastern Guangdong around March 2016 and is further associated with a high rate of adaptive molecular evolution. Since March 2013, three waves of human infection with avian influenza A(H7N9) virus have been detected in China. To investigate virus transmission within and across epidemic waves, we used surveillance data and whole-genome analysis of viruses sampled in Guangdong during 2013-2015. We observed a geographic shift of human A(H7N9) infections from the second to the third waves. Live poultry market interventions were undertaken in epicenter cities; however, spatial phylogenetic analysis indicated that the third-wave outbreaks in central Guangdong most likely resulted from local virus persistence rather than introduction from elsewhere. Although the number of clinical cases in humans declined by 35% from the second to the third waves, the genetic diversity of third-wave viruses in Guangdong increased. Our results highlight the epidemic risk to a region reporting comparatively few A(H7N9) cases. Moreover, our results suggest that live-poultry market interventions cannot completely halt A(H7N9) virus persistence and dissemination. To evaluate the antigenic relationship between bat mumps virus (BMV) and the JL5 vaccine strain of mumps virus (MuVJL5), we rescued a chimeric virus bearing the F and HN glycoproteins of BMV in the background of a recombinant JL5 genome (rMuVJL5). Cross-reactivity and cross-neutralization between this chimeric recombinant MuV bearing the F and HN glycoproteins of BMV (rMuVJL5-F/HNBMV) virus and rMuVJL5 were demonstrated using hyperimmune mouse serum samples and a curated panel of human serum. All mouse and human serum samples that were able to neutralize rMuVJL5 infection had cross-neutralizing activity against rMuVJL5-F/HNBMV. Our data suggest that persons who have neutralizing antibodies against MuV might be protected from infection by BMV. Human serum IgG contains multiple glycoforms which exhibit a range of binding properties to effector molecules such as cellular Fc receptors. Emerging knowledge of how the Fc glycans contribute to the antibody structure and effector functions has opened new avenues for the exploitation of defined antibody glycoforms in the treatment of diseases. Here, we review the structure and activity of antibody glycoforms and highlight developments in antibody glycoengineering by both the manipulation of the cellular glycosylation machinery and by chemoenzymatic synthesis. We discuss wide ranging applications of antibody glycoengineering in the treatment of cancer, autoimmunity and inflammation. 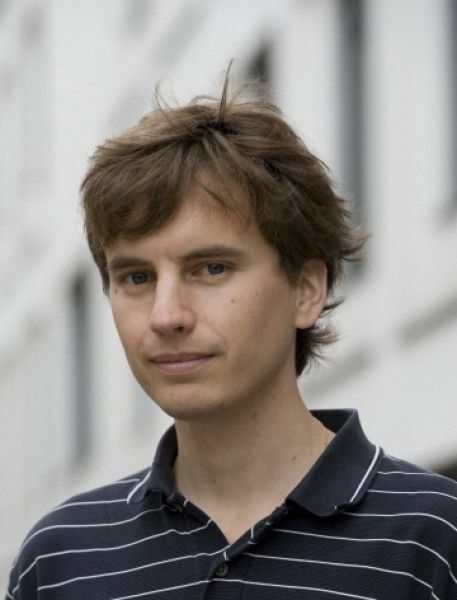 This article is part of a Special Issue entitled "Glycans in personalised medicine" Guest Editor: Professor Gordan Lauc. Ebola viruses (EBOVs) are responsible for repeated outbreaks of fatal infections, including the recent deadly epidemic in West Africa. There are currently no approved therapeutic drugs or vaccines for the disease. EBOV has a membrane envelope decorated by trimers of a glycoprotein (GP, cleaved by furin to form GP1 and GP2 subunits), which is solely responsible for host cell attachment, endosomal entry and membrane fusion. GP is thus a primary target for the development of antiviral drugs. Here we report the first, to our knowledge, unliganded structure of EBOV GP, and high-resolution complexes of GP with the anticancer drug toremifene and the painkiller ibuprofen. The high-resolution apo structure gives a more complete and accurate picture of the molecule, and allows conformational changes introduced by antibody and receptor binding to be deciphered. Unexpectedly, both toremifene and ibuprofen bind in a cavity between the attachment (GP1) and fusion (GP2) subunits at the entrance to a large tunnel that links with equivalent tunnels from the other monomers of the trimer at the three-fold axis. Protein–drug interactions with both GP1 and GP2 are predominately hydrophobic. Residues lining the binding site are highly conserved among filoviruses except Marburg virus (MARV), suggesting that MARV may not bind these drugs. Thermal shift assays show up to a 14 °C decrease in the protein melting temperature after toremifene binding, while ibuprofen has only a marginal effect and is a less potent inhibitor. These results suggest that inhibitor binding destabilizes GP and triggers premature release of GP2, thereby preventing fusion between the viral and endosome membranes. Thus, these complex structures reveal the mechanism of inhibition and may guide the development of more powerful anti-EBOV drugs. An emergent viral pathogen termed severe fever with thrombocytopenia syndrome virus (SFTSV) is responsible for thousands of clinical cases and associated fatalities in China, Japan, and South Korea. Akin to other phleboviruses, SFTSV relies on a viral glycoprotein, Gc, to catalyze the merger of endosomal host and viral membranes during cell entry. Here, we describe the postfusion structure of SFTSV Gc, revealing that the molecular transformations the phleboviral Gc undergoes upon host cell entry are conserved with otherwise unrelated alpha- and flaviviruses. By comparison of SFTSV Gc with that of the prefusion structure of the related Rift Valley fever virus, we show that these changes involve refolding of the protein into a trimeric state. Reverse genetics and rescue of site-directed histidine mutants enabled localization of histidines likely to be important for triggering this pH-dependent process. These data provide structural and functional evidence that the mechanism of phlebovirus-host cell fusion is conserved among genetically and patho-physiologically distinct viral pathogens. Surface glycoproteins direct cellular targeting, attachment, and membrane fusion of arenaviruses and are the primary target for neutralizing antibodies. Despite significant conservation of the glycoprotein architecture across the arenavirus family, there is considerable variation in the molecular recognition mechanisms used during host cell entry. We review recent progress in dissecting these infection events and describe how arenaviral glycoproteins can be targeted by small-molecule antivirals, the natural immune response, and immunoglobulin-based therapeutics. Arenaviral glycoprotein-mediated assembly and infection pathways present numerous opportunities and challenges for therapeutic intervention. BACKGROUND: In recent decades, the GII.4 norovirus genotype has predominated in epidemics worldwide and been associated with an increased rate of evolutionary change. In 2014, a novel GII.17 variant emerged and persisted, causing large outbreaks of gastroenteritis in China and sporadic infections globally. The origin, evolution, and transmission history of this new variant are largely unknown. METHODS: We generated 103 full capsid and 8 whole-genome sequences of GII.17 strains collected between August 2013 and November 2015 in Guangdong, China. Phylogenetic analyses were performed by integrating our data with those for all publically available GII.17 sequences. RESULTS: The novel emergent lineage GII.17_Kawasaki_2014 most likely originated from Africa around 2001 and evolved at a rate of 5.6 × 10(-3) substitutions/site/year. Within this lineage, a new variant containing several important amino acid changes emerged around August 2013 and caused extensive epidemics in 2014-2015. The phylodynamic and epidemic history of the GII.17_Kawasaki lineage shows similarities with the pattern observed for GII.4 norovirus evolution. Virus movements from Hong Kong to neighboring coastal cities were frequently observed. CONCLUSIONS: Our results provide new insights into GII.17 norovirus evolution and transmission and highlight the potential for a rare norovirus genotype to rapidly replace existing strains and cause local epidemics. Hantaviruses, a geographically diverse group of zoonotic pathogens, initiate cell infection through the concerted action of Gn and Gc viral surface glycoproteins. Here, we describe the high-resolution crystal structure of the antigenic ectodomain of Gn from Puumala hantavirus (PUUV), a causative agent of hemorrhagic fever with renal syndrome. Fitting of PUUV Gn into an electron cryomicroscopy reconstruction of intact Gn-Gc spike complexes from the closely related but non-pathogenic Tula hantavirus localized Gn tetramers to the membrane-distal surface of the virion. The accuracy of the fitting was corroborated by epitope mapping and genetic analysis of available PUUV sequences. Interestingly, Gn exhibits greater non-synonymous sequence diversity than the less accessible Gc, supporting a role of the host humoral immune response in exerting selective pressure on the virus surface. The fold of PUUV Gn is likely to be widely conserved across hantaviruses. Brazil has experienced an unprecedented epidemic of Zika virus (ZIKV), with ~30,000 cases reported to date. ZIKV was first detected in Brazil in May 2015, and cases of microcephaly potentially associated with ZIKV infection were identified in November 2015. We performed next-generation sequencing to generate seven Brazilian ZIKV genomes sampled from four self-limited cases, one blood donor, one fatal adult case, and one newborn with microcephaly and congenital malformations. Results of phylogenetic and molecular clock analyses show a single introduction of ZIKV into the Americas, which we estimated to have occurred between May and December 2013, more than 12 months before the detection of ZIKV in Brazil. The estimated date of origin coincides with an increase in air passengers to Brazil from ZIKV-endemic areas, as well as with reported outbreaks in the Pacific Islands. ZIKV genomes from Brazil are phylogenetically interspersed with those from other South American and Caribbean countries. Mapping mutations onto existing structural models revealed the context of viral amino acid changes present in the outbreak lineage; however, no shared amino acid changes were found among the three currently available virus genomes from microcephaly cases. Municipality-level incidence data indicate that reports of suspected microcephaly in Brazil best correlate with ZIKV incidence around week 17 of pregnancy, although this correlation does not demonstrate causation. Our genetic description and analysis of ZIKV isolates in Brazil provide a baseline for future studies of the evolution and molecular epidemiology of this emerging virus in the Americas. Lassa virus is an enveloped, bi-segmented RNA virus and the most prevalent and fatal of all Old World arenaviruses. Virus entry into the host cell is mediated by a tripartite surface spike complex, which is composed of two viral glycoprotein subunits, GP1 and GP2, and the stable signal peptide. Of these, GP1 binds to cellular receptors and GP2 catalyzes fusion between the viral envelope and the host cell membrane during endocytosis. The molecular structure of the spike and conformational rearrangements induced by low pH, prior to fusion, remain poorly understood. Here, we analyzed the three-dimensional ultrastructure of Lassa virus using electron cryotomography. Sub-tomogram averaging yielded a structure of the glycoprotein spike at 14-Å resolution. The spikes are trimeric, cover the virion envelope, and connect to the underlying matrix. Structural changes to the spike, following acidification, support a viral entry mechanism dependent on binding to the lysosome-resident receptor LAMP1 and further dissociation of the membrane-distal GP1 subunits. The highly glycosylated glycoprotein spike of Ebola virus (EBOV-GP1,2) is the primary target of the humoral host response. Recombinant EBOV-GP ectodomain (EBOV-GP1,2ecto) expressed in mammalian cells was used to immunize sheep and elicited a robust immune response and produced high titers of high avidity polyclonal antibodies. Investigation of the neutralizing activity of the ovine antisera in vitro revealed that it neutralized EBOV. A pool of intact ovine immunoglobulin G, herein termed EBOTAb, was prepared from the antisera and used for an in vivo guinea pig study. When EBOTAb was delivered 6 hours after challenge, all animals survived without experiencing fever or other clinical manifestations. In a second series of guinea pig studies, the administration of EBOTAb dosing was delayed for 48 or 72 hours after challenge, resulting in 100% and 75% survival, respectively. These studies illustrate the usefulness of EBOTAb in protecting against EBOV-induced disease. Glycan analysis of virion-derived glycoproteins is challenging due to the difficulties in glycoprotein isolation and low sample abundance. Here, we describe how ion mobility mass spectrometry can be used to obtain spectra from virion samples. We also describe how negative ion fragmentation of glycans can be used to probe structural features of virion glycans. The envelope spike of HIV-1 employs a 'glycan shield' to protect itself from antibody-mediated neutralization. Paradoxically, however, potent broadly neutralizing antibodies (bnAbs) that target this shield have been isolated. The unusually high glycan density on the gp120 subunit limits processing during biosynthesis, leaving a region of under-processed oligomannose-type structures, which is a primary target of these bnAbs. Here we investigate the contribution of individual glycosylation sites in the formation of this so-called intrinsic mannose patch. Deletion of individual sites has a limited effect on the overall size of the intrinsic mannose patch but leads to changes in the processing of neighbouring glycans. These structural changes are largely tolerated by a panel of glycan-dependent bnAbs targeting these regions, indicating a degree of plasticity in their recognition. These results support the intrinsic mannose patch as a stable target for vaccine design. The discovery of African henipaviruses (HNVs) related to pathogenic Hendra virus (HeV) and Nipah virus (NiV) from Southeast Asia and Australia presents an open-ended health risk. Cell receptor use by emerging African HNVs at the stage of host-cell entry is a key parameter when considering the potential for spillover and infection of human populations. The attachment glycoprotein from a Ghanaian bat isolate (GhV-G) exhibits <30% sequence identity with Asiatic NiV-G/HeV-G. Here, through functional and structural analysis of GhV-G, we show how this African HNV targets the same human cell-surface receptor (ephrinB2) as the Asiatic HNVs. We first characterized this virus-receptor interaction crystallographically. Compared with extant HNV-G-ephrinB2 structures, there was significant structural variation in the six-bladed β-propeller scaffold of the GhV-G receptor-binding domain, but not the Greek key fold of the bound ephrinB2. Analysis revealed a surprisingly conserved mode of ephrinB2 interaction that reflects an ongoing evolutionary constraint among geographically distal and phylogenetically divergent HNVs to maintain the functionality of ephrinB2 recognition during virus-host entry. Interestingly, unlike NiV-G/HeV-G, we could not detect binding of GhV-G to ephrinB3. Comparative structure-function analysis further revealed several distinguishing features of HNV-G function: a secondary ephrinB2 interaction site that contributes to more efficient ephrinB2-mediated entry in NiV-G relative to GhV-G and cognate residues at the very C terminus of GhV-G (absent in Asiatic HNV-Gs) that are vital for efficient receptor-induced fusion, but not receptor binding per se. These data provide molecular-level details for evaluating the likelihood of African HNVs to spill over into human populations. UNLABELLED: Nipah virus (NiV) is a deadly emerging enveloped paramyxovirus that primarily targets human endothelial cells. Endothelial cells express the innate immune effector galectin-1 that we have previously shown can bind to specific N-glycans on the NiV envelope fusion glycoprotein (F). NiV-F mediates fusion of infected endothelial cells into syncytia, resulting in endothelial disruption and hemorrhage. Galectin-1 is an endogenous carbohydrate-binding protein that binds to specific glycans on NiV-F to reduce endothelial cell fusion, an effect that may reduce pathophysiologic sequelae of NiV infection. However, galectins play multiple roles in regulating host-pathogen interactions; for example, galectins can promote attachment of HIV to T cells and macrophages and attachment of HSV-1 to keratinocytes but can also inhibit influenza entry into airway epithelial cells. Using live Nipah virus, in the present study, we demonstrate that galectin-1 can enhance NiV attachment to and infection of primary human endothelial cells by bridging glycans on the viral envelope to host cell glycoproteins. In order to exhibit an enhancing effect, galectin-1 must be present during the initial phase of virus attachment; in contrast, addition of galectin-1 postinfection results in reduced production of progeny virus and syncytium formation. Thus, galectin-1 can have dual and opposing effects on NiV infection of human endothelial cells. While various roles for galectin family members in microbial-host interactions have been described, we report opposing effects of the same galectin family member on a specific virus, with the timing of exposure during the viral life cycle determining the outcome. IMPORTANCE: Nipah virus is an emerging pathogen that targets endothelial cells lining blood vessels; the high mortality rate (up to 70%) in Nipah virus infections results from destruction of these cells and resulting catastrophic hemorrhage. Host factors that promote or prevent Nipah virus infection are not well understood. Endogenous human lectins, such as galectin-1, can function as pattern recognition receptors to reduce infection and initiate immune responses; however, lectins can also be exploited by microbes to enhance infection of host cells. We found that galectin-1, which is made by inflamed endothelial cells, can both promote Nipah virus infection of endothelial cells by "bridging" the virus to the cell, as well as reduce production of progeny virus and reduce endothelial cell fusion and damage, depending on timing of galectin-1 exposure. This is the first report of spatiotemporal opposing effects of a host lectin for a virus in one type of host cell. Zoonotic transmission of lethal henipaviruses (HNVs) from their natural fruit bat reservoirs to humans has only been reported in Australia and South/Southeast Asia. However, a recent study discovered numerous HNV clades in African bat samples. To determine the potential for HNV spillover events among humans in Africa, here we examine well-curated sets of bat (Eidolon helvum, n = 44) and human (n = 497) serum samples from Cameroon for Nipah virus (NiV) cross-neutralizing antibodies (NiV-X-Nabs). Using a vesicular stomatitis virus (VSV)-based pseudoparticle seroneutralization assay, we detect NiV-X-Nabs in 48% and 3-4% of the bat and human samples, respectively. Seropositive human samples are found almost exclusively in individuals who reported butchering bats for bushmeat. Seropositive human sera also neutralize Hendra virus and Gh-M74a (an African HNV) pseudoparticles, as well as live NiV. Butchering bat meat and living in areas undergoing deforestation are the most significant risk factors associated with seropositivity. Evidence for HNV spillover events warrants increased surveillance efforts. Enveloped viruses utilize membrane glycoproteins on their surface to mediate entry into host cells. Three-dimensional structural analysis of these glycoprotein 'spikes' is often technically challenging but important for understanding viral pathogenesis and in drug design. Here, a protocol is presented for viral spike structure determination through computational averaging of electron cryo-tomography data. Electron cryo-tomography is a technique in electron microscopy used to derive three-dimensional tomographic volume reconstructions, or tomograms, of pleomorphic biological specimens such as membrane viruses in a near-native, frozen-hydrated state. These tomograms reveal structures of interest in three dimensions, albeit at low resolution. Computational averaging of sub-volumes, or sub-tomograms, is necessary to obtain higher resolution detail of repeating structural motifs, such as viral glycoprotein spikes. A detailed computational approach for aligning and averaging sub-tomograms using the Jsubtomo software package is outlined. This approach enables visualization of the structure of viral glycoprotein spikes to a resolution in the range of 20-40 Å and study of the study of higher order spike-to-spike interactions on the virion membrane. Typical results are presented for Bunyamwera virus, an enveloped virus from the family Bunyaviridae. This family is a structurally diverse group of pathogens posing a threat to human and animal health. Uukuniemi virus (UUKV) is a model system for investigating the genus Phlebovirus of the Bunyaviridae. We report the UUKV glycome, revealing differential processing of the Gn and Gc virion glycoproteins. Both glycoproteins display poly-N-acetyllactosamines, consistent with virion assembly in the medial Golgi apparatus, whereas oligomannose-type glycans required for DC-SIGN-dependent cellular attachment are predominant on Gc. Local virion structure and the route of viral egress from the cell leave a functional imprint on the phleboviral glycome. Cross-species viral transmission subjects parent and progeny alphaviruses to differential post-translational processing of viral envelope glycoproteins. Alphavirus biogenesis has been extensively studied, and the Semliki Forest virus E1 and E2 glycoproteins have been shown to exhibit differing degrees of processing of N-linked glycans. However the composition of these glycans, including that arising from different host cells, has not been determined. Here we determined the chemical composition of the glycans from the prototypic alphavirus, Semliki Forest virus, propagated in both arthropod and rodent cell lines, by using ion-mobility mass spectrometry and collision-induced dissociation analysis. We observe that both the membrane-proximal E1 fusion glycoprotein and the protruding E2 attachment glycoprotein display heterogeneous glycosylation that contains N-linked glycans exhibiting both limited and extensive processing. However, E1 contained predominantly highly processed glycans dependent on the host cell, with rodent and mosquito-derived E1 exhibiting complex-type and paucimannose-type glycosylation, respectively. In contrast, the protruding E2 attachment glycoprotein primarily contained conserved under-processed oligomannose-type structures when produced in both rodent and mosquito cell lines. It is likely that glycan processing of E2 is structurally restricted by steric-hindrance imposed by local viral protein structure. This contrasts E1, which presents glycans characteristic of the host cell and is accessible to enzymes. We integrated our findings with previous cryo-electron microscopy and crystallographic analyses to produce a detailed model of the glycosylated mature virion surface. Taken together, these data reveal the degree to which virally encoded protein structure and cellular processing enzymes shape the virion glycome during interspecies transmission of Semliki Forest virus. Guanarito virus (GTOV) is an emergent and deadly pathogen. We present the crystal structure of the glycosylated GTOV fusion glycoprotein to 4.1-Å resolution in the postfusion conformation. Our structure reveals a classical six-helix bundle and presents direct verification that New World arenaviruses exhibit class I viral membrane fusion machinery. The structure provides visualization of an N-linked glycocalyx coat, and consideration of glycan dynamics reveals extensive coverage of the underlying protein surface, following virus-host membrane fusion. Biologically active conformations of the IgG1 Fc homodimer are maintained by multiple hydrophobic interactions between the protein surface and the N-glycan. The Fc glycan modulates biological effector functions, including antibody-dependent cellular cytotoxicity (ADCC) which is mediated in part through the activatory Fc receptor, FcγRIIIA. Consistent with previous reports, we found that site-directed mutations disrupting the protein-carbohydrate interface (F241A, F243A, V262E, and V264E) increased galactosylation and sialylation of the Fc and, concomitantly, reduced the affinity for FcγRIIIA. We rationalized this effect by crystallographic analysis of the IgG1 Fc F241A mutant, determined here to a resolution of 1.9 Å, which revealed localized destabilization of this glycan-protein interface. Given that sialylation of Fc glycans decreases ADCC, one explanation for the effect of these mutants on FcγRIIIA binding is their increased sialylation. However, a glycan-engineered IgG1 with hypergalactosylated and hypersialylated glycans exhibited unchanged binding affinity to FcγRIIIA. Moreover, when we expressed these mutants as a chemically uniform (Man5GlcNAc2) glycoform, the individual effect of each mutation on FcγRIIIA affinity was preserved. This effect was broadly recapitulated for other Fc receptors (FcγRI, FcγRIIA, FcγRIIB, and FcγRIIIB). These data indicate that destabilization of the glycan-protein interactions, rather than increased galactosylation and sialylation, modifies the Fc conformation(s) relevant for FcγR binding. Engineering of the protein-carbohydrate interface thus provides an independent parameter in the engineering of Fc effector functions and a route to the synthesis of new classes of Fc domain with novel combinations of affinities for activatory and inhibitory Fc receptors. The genus Orthobunyavirus within the family Bunyaviridae constitutes an expanding group of emerging viruses, which threaten human and animal health. Despite the medical importance, little is known about orthobunyavirus structure, a prerequisite for understanding virus assembly and entry. Here, using electron cryo-tomography, we report the ultrastructure of Bunyamwera virus, the prototypic member of this genus. Whilst Bunyamwera virions are pleomorphic in shape, they display a locally ordered lattice of glycoprotein spikes. Each spike protrudes 18 nm from the viral membrane and becomes disordered upon introduction to an acidic environment. Using sub-tomogram averaging, we derived a three-dimensional model of the trimeric pre-fusion glycoprotein spike to 3-nm resolution. The glycoprotein spike consists mainly of the putative class-II fusion glycoprotein and exhibits a unique tripod-like arrangement. Protein-protein contacts between neighbouring spikes occur at membrane-proximal regions and intra-spike contacts at membrane-distal regions. This trimeric assembly deviates from previously observed fusion glycoprotein arrangements, suggesting a greater than anticipated repertoire of viral fusion glycoprotein oligomerization. Our study provides evidence of a pH-dependent conformational change that occurs during orthobunyaviral entry into host cells and a blueprint for the structure of this group of emerging pathogens. In 2009, a novel Bunyavirus, called severe fever with thrombocytopenia syndrome virus (SFTSV) was identified in the vicinity of Huaiyangshan, China. Clinical symptoms of this zoonotic virus included severe fever, thrombocytopenia, and leukocytopenia, with a mortality rate of ~10%. By the end of 2011 the disease associated with this pathogen had been reported from eleven Chinese provinces and human-to-human transmission suspected. However, current understanding of the evolution and molecular epidemiology of SFTSV before and after its identification is limited. To address this we undertake phylogenetic, evolutionary and structural analyses of all available SFTSV genetic sequences, including a new SFTSV complete genome isolated from a patient from Henan in 2011. Our discovery of a mosaic L segment sequence, which is descended from two major circulating lineages of SFTSV in China, represents the first evidence that homologous recombination plays a role in SFTSV evolution. Selection analyses indicate that negative selection is predominant in SFTSV genes, yet differences in selective forces among genes are consistent between Phlebovirus species. Further analysis reveals structural conservation between SFTSV and Rift Valley fever virus in the residues of their nucleocapsids that are responsible for oligomerisation and RNA-binding, suggesting the viruses share similar modes of higher-order assembly. We reconstruct the epidemic history of SFTSV using molecular clock and coalescent-based methods, revealing that the extant SFTSV lineages originated 50-150 years ago, and that the viral population experienced a recent growth phase that concurs with and extends the earliest serological reports of SFTSV infection. Taken together, our combined structural and phylogenetic analyses shed light into the evolutionary behaviour of SFTSV in the context of other, better-known, pathogenic Phleboviruses. Few questions on infectious disease are more important than understanding how and why avian influenza A viruses successfully emerge in mammalian populations, yet little is known about the rate and nature of the virus' genetic adaptation in new hosts. Here, we measure, for the first time, the genomic rate of adaptive evolution of swine influenza viruses (SwIV) that originated in birds. By using a curated dataset of more than 24 000 human and swine influenza gene sequences, including 41 newly characterized genomes, we reconstructed the adaptive dynamics of three major SwIV lineages (Eurasian, EA; classical swine, CS; triple reassortant, TR). We found that, following the transfer of the EA lineage from birds to swine in the late 1970s, EA virus genes have undergone substantially faster adaptive evolution than those of the CS lineage, which had circulated among swine for decades. Further, the adaptation rates of the EA lineage antigenic haemagglutinin and neuraminidase genes were unexpectedly high and similar to those observed in human influenza A. We show that the successful establishment of avian influenza viruses in swine is associated with raised adaptive evolution across the entire genome for many years after zoonosis, reflecting the contribution of multiple mutations to the coordinated optimization of viral fitness in a new environment. This dynamics is replicated independently in the polymerase genes of the TR lineage, which established in swine following separate transmission from non-swine hosts. Human IgG Fc glycosylation modulates immunological effector functions such as antibody-dependent cellular cytotoxicity and phagocytosis. Engineering of Fc glycans therefore enables fine-tuning of the therapeutic properties of monoclonal antibodies. The N-linked glycans of Fc are typically complex-type, forming a network of noncovalent interactions along the protein surface of the Cγ2 domain. Here, we manipulate the mammalian glycan-processing pathway to trap IgG1 Fc at sequential stages of maturation, from oligomannose- to hybrid- to complex-type glycans, and show that the Fc is structurally stabilized following the transition of glycans from their hybrid- to complex-type state. X-ray crystallographic analysis of this hybrid-type intermediate reveals that N-linked glycans undergo conformational changes upon maturation, including a flip within the trimannosyl core. Our crystal structure of this intermediate reveals a molecular basis for antibody biogenesis and provides a template for the structure-guided engineering of the protein-glycan interface of therapeutic antibodies. Serum IgG is a potent inhibitor of monoclonal antibody (mAb) binding to the cell-surface Fcγ receptors (FcγRs), which mediate cytotoxic and phagocytic effector functions. Here, we show that this competition can be eliminated, selectively, by the introduction to serum of (i) an enzyme that displaces Fc from FcγRs and (ii) a modification present in the therapeutic mAb that renders it resistant to that enzyme. Specifically, we show that (i) EndoS (endoglycosidase S) cleaves only complex-type glycans of the type found on IgG but (ii) is inactive against an engineered IgG Fc with oligomannose-type glycans. EndoS thus reduces FcγR binding of serum IgG, but not that of engineered mAb. Introduction of both the engineered mAb and endoglycosidase in serum leads to a dramatic increase in FcγR binding compared to the introduction of mAb in serum alone. Antibody receptor refocusing is a general technique for boosting the effector signal of therapeutic antibodies. © 2012 Elsevier Ltd.
As obligate parasites, viruses are required to enter and replicate within their host, a process which employs many of their proteins to hijack natural cellular processes. High resolution X-ray crystallographic analysis has proven to be an ideal method to visualize the mechanisms by which such virus-host interactions occur and has revealed the innovative capacity of viruses to adapt efficiently to their hosts. 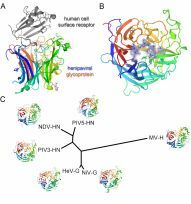 In this review, we draw upon recently elucidated paramyxovirus-, arenavirus-, and poxvirus-host protein complex crystal structures to reveal both the capacity of viruses to appropriate one component of a physiological protein-protein binding event (often modifying it to out-compete the host-protein), and the ability to utilize novel binding sites on host cell surface receptors. The structures discussed shed light on a number of biological processes ranging from viral entry to virulence and host antagonism. Drawn together they reveal the common strategies which viruses have evolved to interact with their natural host. The structures also support molecular level rationales for how viruses can be transmitted to unrelated organisms and thus pose severe health risks. © 2011 Elsevier Inc.
Members within the paramyxovirus subfamily Paramyxovirinae constitute a large number of highly virulent human and animal pathogens. The glycoproteins present on these viruses are responsible for mediating host cell attachment and fusion and are key targets for the design of antiviral entry inhibitors. In the present review, we discuss recent structural studies which have led to a better understanding of the various mechanisms by which different paramyxoviruses use their attachment glycoproteins to hijack specific protein and glycan cell-surface receptors to facilitate viral entry. It is observed that the paramyxovirus attachment glycoprotein consists of a conserved overall structure which includes an N-terminal six-bladed β-propeller domain which is responsible for cell receptor binding. Crystal structures of this domain from different biomedically important paramyxoviruses, including measles, Nipah, Hendra, Newcastle disease and parainfluenza viruses, alone and in complex with their functional cell-surface receptors, demonstrate three contrasting mechanisms of receptor engagement that paramyxoviruses have evolved to confer discreet protein- and glycan-receptor specificity. This structural information highlights the adaptability of the paramyxovirus attachment glycoprotein surface and the potential for the emergence of new and potentially harmful viruses in human hosts. Hendra virus is a negative-sense single-stranded RNA virus within the Paramyxoviridae family which, together with Nipah virus, forms the Henipavirus genus. Infection with bat-borne Hendra virus leads to a disease with high mortality rates in humans. We determined the crystal structure of the unliganded six-bladed beta-propeller domain and compared it to the previously reported structure of Hendra virus attachment glycoprotein (HeV-G) in complex with its cellular receptor, ephrin-B2. As observed for the related unliganded Nipah virus structure, there is plasticity in the Glu579-Pro590 and Lys236-Ala245 ephrin-binding loops prior to receptor engagement. These data reveal that henipaviral attachment glycoproteins undergo common structural transitions upon receptor binding and further define the structural template for antihenipaviral drug design. 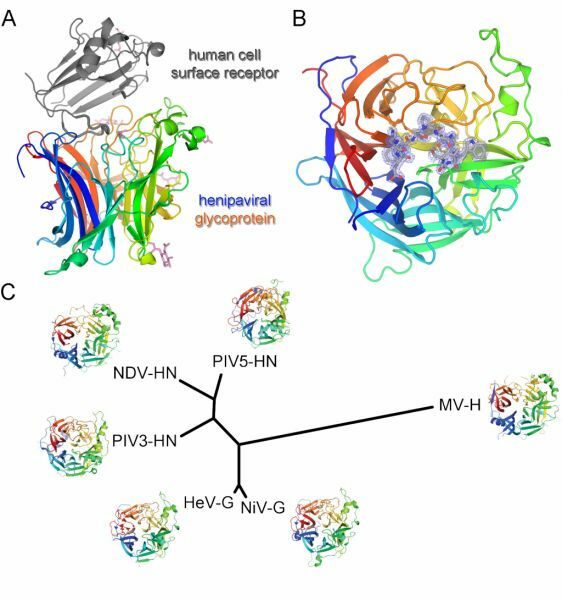 Our analysis also provides experimental evidence for a dimeric arrangement of HeV-G that exhibits striking similarity to those observed in crystal structures of related paramyxovirus receptor-binding glycoproteins. The biological relevance of this dimer is further supported by the positional analysis of glycosylation sites from across the paramyxoviruses. In HeV-G, the sites lie away from the putative dimer interface and remain accessible to alpha-mannosidase processing on oligomerization. We therefore propose that the overall mode of dimer assembly is conserved for all paramyxoviruses; however, while the geometry of dimerization is rather closely similar for those viruses that bind flexible glycan receptors, significant (up to 60 degrees ) and different reconfigurations of the subunit packing (associated with a significant decrease in the size of the dimer interface) have accompanied the independent switching to high-affinity protein receptor binding in Hendra and measles viruses. Absolute rate constants were determined for the abstraction of hydrogen atoms from (OC)(3)Fe(mu-SH)(2)Fe(CO)(3) (Fe(2)S(2)H(2)) and (OC)(3)Fe(mu-SCH(3))(mu-SH)Fe(CO)(3) (Fe(2)S(2)MeH) by benzyl radicals in benzene. From the temperature-dependent rate data for Fe(2)S(2)H(2), DeltaH(++) and DeltaS(++) were determined to be 2.03 +/- 0.56 kcal/mol and -19.3 +/- 1.7 cal/(mol K), respectively, giving k(abs) = (1.2 +/- 0.49) x 10(7) M(-1) s(-1) at 25 degrees C. For Fe(2)S(2)MeH, DeltaH(++) and DeltaS(++) were determined to be 1.97 +/- 0.46 kcal/mol and -18.1 +/- 1.5 cal/(mol K), respectively, giving k(abs) = (2.3 +/- 0.23) x 10(7) M(-1) s(-1) at 25 degrees C. Temperature-dependent rate data are also reported for hydrogen atom abstraction by benzyl radical from thiophenol (DeltaH(++) = 3.62 +/- 0.43 kcal/mol, DeltaS(++) = -21.7 +/- 1.3 cal/(mol K)) and H(2)S (DeltaH(++) = 5.13 +/- 0.99 kcal/mol, DeltaS(++) = -24.8 +/- 3.2 cal/(mol K)), giving k(abs) at 25 degrees C of (2.5 +/- 0.33) x 10(5) and (4.2 +/- 0.51) x 10(3) M(-1) s(-1), respectively, both having hydrogen atom abstraction rate constants orders of magnitude slower than those of Fe(2)S(2)H(2) and Fe(2)S(2)MeH. Thus, Fe(2)S(2)MeH is 100-fold faster than thiophenol, known as a fast donor. All rate constants are reported per abstractable hydrogen atom (k(abs)/M(-1) s(-1)/H). DFT calculations predict S-H bond strengths of 73.1 and 73.2 kcal/mol for Fe(2)S(2)H(2) and Fe(2)S(2)MeH, respectively. Free energy and NMR chemical shift calculations confirm the NMR assignments and populations of Fe(2)S(2)H(2) and Fe(2)S(2)MeH isomers. Derived radicals Fe(2)S(2)H(*) and Fe(2)S(2)Me(*) exhibit singly occupied HOMOs with unpaired spin density distributed between the two Fe atoms, a bridging sulfur, and d(sigma)-bonding between Fe centers. The S-H solution bond dissociation free energy (SBDFE) of Fe(2)S(2)MeH was found to be 69.4 +/- 1.7 kcal/mol by determination of its pK(a) (16.0 +/- 0.4) and the potential for the oxidation of the anion, Fe(2)S(2)Me(-), of -0.26 +/- 0.05 V vs ferrocene in acetonitrile (corrected for dimerization of Fe(2)S(2)Me(*)). This SBDFE for Fe(2)S(2)MeH corresponds to a gas-phase bond dissociation enthalpy (BDE) of 74.2 kcal/mol, in satisfactory agreement with the DFT value of 73.2 kcal/mol. Replacement of the Fe-Fe bond in Fe(2)S(2)MeH with bridging mu-S (Fe(2)S(3)MeH) or mu-CO (Fe(2)S(2)(CO)MeH) groups leads to (DFT) BDEs of 72.8 and 66.2 kcal/mol, the latter indicating dramatic effects of the choice of bridge structure on S-H bond strengths. These results provide a model for the reactivity of hydrosulfido sites of low-valent heterogeneous FeS catalysts. New World arenaviruses, which cause severe hemorrhagic fever, rely upon their envelope glycoproteins for attachment and fusion into their host cell. Here we present the crystal structure of the Machupo virus GP1 attachment glycoprotein, which is responsible for high-affinity binding at the cell surface to the transferrin receptor. This first structure of an arenavirus glycoprotein shows that GP1 consists of a novel alpha/beta fold. This provides a blueprint of the New World arenavirus attachment glycoproteins and reveals a new architecture of viral attachment, using a protein fold of unknown origins. Antibodies contain a conserved glycosylation site that has emerged as a target for the modulation of antibody effector functions. The crystal structure of a biosynthetic intermediate of human IgG1, bearing immature oligomannose-type glycans and reported to display increased antibody-dependent cellular cytotoxicity, demonstrates that glycan engineering can bias the Fc to an open conformation primed for receptor binding. CD1a is expressed on Langerhans cells (LCs) and dendritic cells (DCs), where it mediates T cell recognition of glycolipid and lipopeptide antigens that contain either one or two alkyl chains. We demonstrate here that CD1a-restricted T cells can discriminate the peptide component of didehydroxymycobactin lipopeptides. Structure analysis of CD1a cocrystallized with a synthetic mycobactin lipopeptide at 2.8 A resolution further reveals that the single alkyl chain is inserted deep within the A' pocket of the groove, whereas its two peptidic branches protrude along the F' pocket to the outer, alpha-helical surface of CD1a for recognition by the TCR. Remarkably, the cyclized lysine branch of the peptide moiety lies in the shallow F' pocket in a conformation that closely mimics that of the alkyl chain in the CD1a-sulfatide structure. Thus, this structural study illustrates how a single chain lipid can be presented by CD1 and that the peptide moiety of the lipopeptide is recognized by the TCR. Three zinc succinate coordination polymers have been synthesised hydrothermally. Two polymorphs of Zn(C4H4O4) adopt three-dimensional structures consisting of tetrahedral Zn atoms isolated from each other via bis-bidentate succinate moieties. The polymorphs differ in the conformation of the succinate group, the a form (I) having syn-periplanar geometry whereas the β form (II) has anti-periplanar geometry. K 2Zn(C4H4O4)2 (III) has a layered structure also composed of isolated tetrahedral Zn units. In this case the two crystallographically distinct succinate groups, one of each conformer, have bis-monodentate coordination, acting as both inter- and intra-layer bridges between neighbouring Zn-containing layers. The 'double' zinc succinate layers are separated along the b-axis by interlayer potassium ions. © The Royal Society of Chemistry 2003.